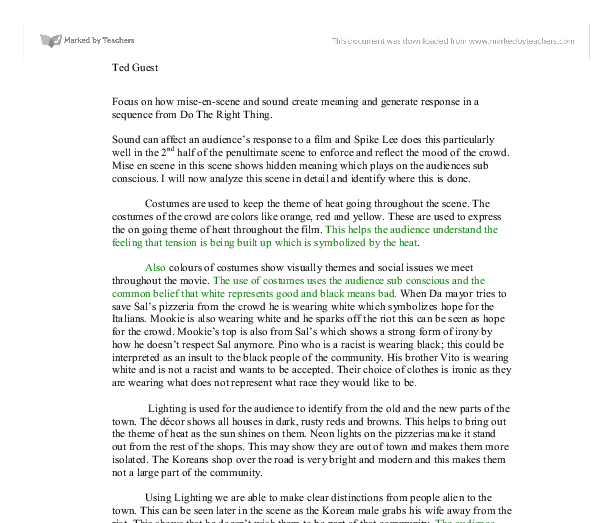 Focus on how mise-en-scene and sound create meaning and generate response in a sequence from Do The Right Thing. 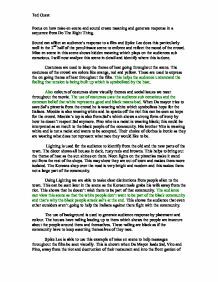 Focus on how mise-en-scene and sound create meaning and generate response in a sequence from Do The Right Thing. Sound can affect an audience's response to a film and Spike Lee does this particularly well in the 2nd half of the penultimate scene to enforce and reflect the mood of the crowd. Mise en scene in this scene shows hidden meaning which plays on the audiences sub conscious. I will now analyze this scene in detail and identify where this is done. Costumes are used to keep the theme of heat going throughout the scene. The costumes of the crowd are colors like orange, red and yellow. These are used to express the on going theme of heat throughout the film. This helps the audience understand the feeling that tension is being built up which is symbolized by the heat. Also colours of costumes show visually themes and social issues we meet throughout the movie. The use of costumes uses the audience sub conscious and the common belief that white represents good and black means bad. When Da mayor tries to save Sal's pizzeria from the crowd he is wearing white which symbolizes hope for the Italians. Mookie is also wearing white and he sparks off the riot this can be seen as hope for the crowd. Mookie's top is also from Sal's which shows a strong form of irony by how he doesn't respect Sal anymore. Pino who is a racist is wearing black; this could be interpreted as an insult to the black people of the community. ...read more. This could be seen when a young child shouts "fight fight" one they are outside and it's available to the whole community. When they are outside Sal loses any hope of not having the community ganging up against him. Sal's is over the road from the Koreans which symbolizes even they are both not from the community they have moved here, This is to signify that as these two businesses are not owned by black people, they are grouped into one area of the neighborhood, the rioters see them as different this can be seen when it looks like the black residents are going to destroy the Koreans shop but don't. Sound plays a role through the whole scene of helping to keep the riot following. It is able to show how people view each other. The diegetic shouts of the crowd are going on throughout the whole riot which helps to show their anger. The start of the scene shows the community voicing their opinions about the death of Radio Raheem. When they talk they wait for one another to speak showing that they are linked as a community and want to show respect for one and another. In this case the sound is used to show the lack of respect and the hatred felt towards Sal. What they are saying shows how much they are building up hatred aimed the people who did this to radio Raheem such as "Murder just like Micheal Stuart" their anger from other racist incidents is coming up. ...read more. At the very end of the scene the song "fight the power" starts up again as Smiley is walking through the remains of Sal's. This is to show that the sprit of Radio Raheem lives on and he died for a cause because the scene ends with Smiley putting a picture of leading black figures on the wall. The song "Fight the Power" has been Radio Raheem; theme throughout the film; its lyrics are about fighting the oppression the black people have suffered at the hands of white people. This song playing shows that even though Radio Raheem is dead the community has risen up against oppression and brought a sense of Justice to his death. The mood of this scene is based around the riot and tension of the day being released on the Italians as they are not black. The use of white costumes to show hope for the community in Mookie and Da Mayor for the Italians, helps the audience to understand there is no good and evil, it's how you interpret each person's problems. The use of speech showing how the community has no respect for the Italians shows the audience how hard it would be for the Italians to get a word in and how they aren't respected. One sentence or one word are chosen well and give meaning and show the underlying emotion of the community. With the ending playing "fight the Power" it sparks of a lot of questions and emotions for the audience. Ted Guest ...read more. up from the bed, his clumsy, slow movements coupled with the machinery inserted in him gives a "Frankenstein" coming to life feel. Jim is unshaven and looks dishevelled, he has a partially shaven head with scars and this suggests to the audience that he has been there for some time. Focus and depth of field were used a number of times within the sequence, this is due to Richard Kelly making the most important things stand out so that they are obvious the audience. The slaves are singing the blues. (Blues are songs that are full of sorrow) This could be effective because the audience could grasp even before the picture emerged that the people who were singing were made to do hard labour. Point of view shots are used to give a characters perspective of looking down a corridor, in the case of Rick when he is in the temple. It shows the fear the characters must be feeling appeals to the audience directly to emphasize with them.